This year, JordanCon is trying something new. They put out a call to all JordanCon members, past and present, and asked for donated stories to compile into an anthology. Twenty were selected to be featured in 2019's edition, entitled You Want Stories? 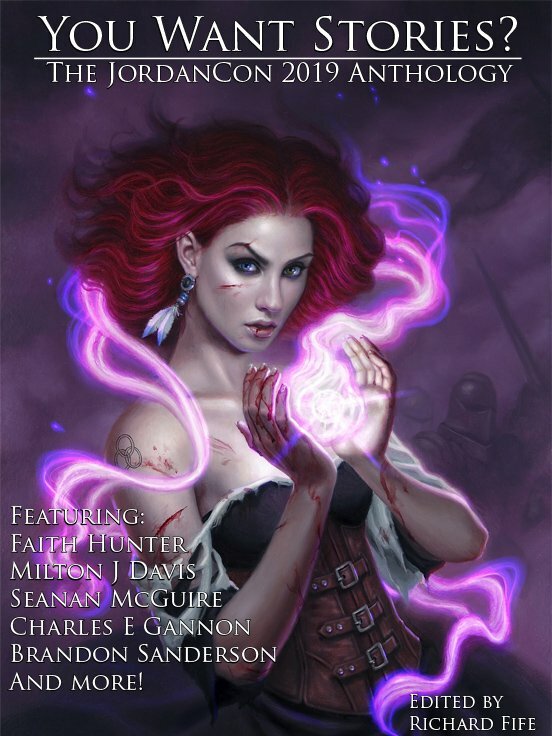 The list of authors is a great one, featuring Brandon Sanderson, our own Jason Denzel, as well as well-known authors such as Seanan McGuire, and Charles E Gannon. The others contributors are: Terry Beyer, Foster Bridget Cassidy, David B. Coe, Blue Cole, Gerald L. Coleman, Milton J Davis, P. Andrew Floyd, John G. Hartness, Alexandra Hill, Robert A. Hilliard, Jr, Faith Hunter, David Alan Jones, Tim Lewis, Jana Oliver, Morgan Smith, and Sarah J. Sover. I'm very happy to say that my offering was accepted! (Written under my pen name Foster Bridget Cassidy.) The beautiful cover art is by Dan dos Santos, this year's JordanCon Artist Guest of Honor. The anthology is available for pre-order now through April 8th, 2019. The Con will have a limited supply to sell to those who have not pre-ordered, but there's no guarantee you will receive a copy. The anthology can ONLY be picked up at JordanCon 11 (April 26th-28th, 2019). The book WILL NOT be shipped anywhere. That said, it is possible to have a friend pick up a copy for you. Check out the details on JordanCon's website. The net proceeds of the anthology will go to the Mayo Clinic. Pre-order now to support some indie (and not-so-indie) authors and the Mayo Clinic! Welcome back to another "Meme Monday." This week, our focus shifts to concepts and ideas within Randland. There are some pretty humorous things that happen in-world. 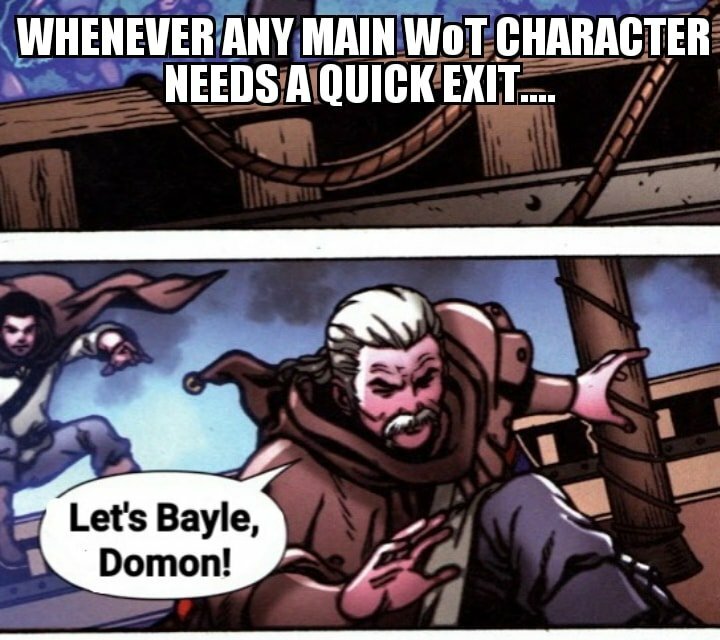 Like, how Bayle Domon is always around to rescue whichever of the main characters is in need. Another globally acceptable idea in Randland is that innkeepers should be plump. And of course, there are the rather unorthodox ways of the Altarans. I wish I could live in Randland. I'm sure many of you wish you could too! The memes this week come from Kevin O'Bryan of DMEN Designs. If you have memes you want to share, email me at frontpage@dragonmount.com. This year, JordanCon is publishing an anthology with stories written by past and present JCon members. Jason Denzel has a story in it. Brandon Sanderson has a story in it. AND I HAVE A STORY IN IT! (Under my pseudonym Foster Bridget Cassidy.) https://www.jordancon.org/product/you-want-stories-the-jordancon-2019-anthology/ I cannot believe my story will be printed alongside Jason's and Brandon's. It's like a fan girl's dream come true. 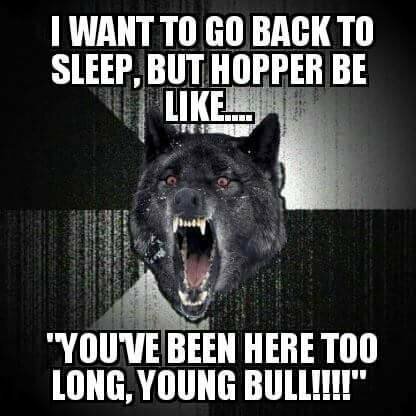 Here are some more Wheel of Time memes. I can't get enough of them! This week features our third favorite ta'veren: Perrin. When the series starts, I loved Perrin more than Rand and Mat. He's the only one who kept his morals after leaving the Two Rivers. As he grows, he's strong, dependable, unyielding. Well, there is that one factor that keeps many readers from adoring him... Unlike most fans, I'm not put off by Faile's captivity by the Shaido. And I don't dislike Perrin's chapters when he's chasing her. For me, it's another facet of his personality that I love. He is dedicated to her and he'll do anything to get her back. If it had been switched, and Tuon or one of Rand's love interests had been taken, I believe Mat and Rand would have acted the same way. Of course, Mat has a bigger, badder army so he has more resources, and Rand has the Asha'man at his disposal, so both could probably achieve success quicker. But that's not Perrin's fault. Perrin's wolfdreams are a huge part of his draw as a character. His abilities in tel'aran'rhiod are almost more impressive than any of the Wise Ones. And let's not forget Mah'alleinir. This is an iconic scene within the whole series. It's powerful and so full of potential. It sets the stage for things to come after the Last Battle. Say what you will, Perrin is still one of my favorite characters! The memes this week come from Kevin O'Bryan of DMEN Designs. 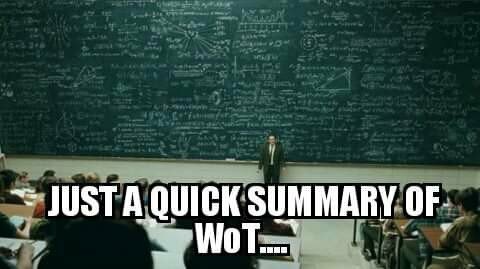 If you have memes you want to share, email me at frontpage@dragonmount.com. Grim Oaks Press has announced a give-away contest where you can win one of 25 advance copies of their upcoming anthology, Unfettered III. Details for entering can be found on Goodreads. Add the book to your shelf to enter the giveaway. Unfortunately, the contest is only open to US and Canada residents. 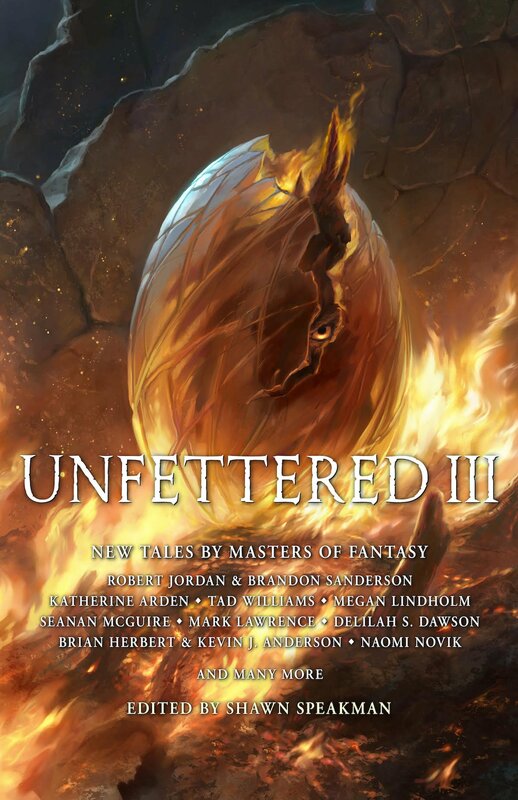 Unfettered III is an anthology of fantasy short stories from some of today's most well-known authors. It includes a deleted 20,000 word sequence (~55 pages in paperback) from A Memory of Light written Brandon Sanderson and Robert Jordan featuring Perrin in the Ways. The sequence is a lengthy "deleted scene" that isn't considered canon to the story, but still offers us a fascinating and exciting adventure. You can read Brandon's comments about the sequence on his website. The anthology also contains a short story from Dragonmount founder Jason Denzel entitled, "The Stone Golem of Qual'Jom." WoT fans will appreciate Jason's epic narrative about a lonely golem living in a cave who waits across eons for his master to return home. Unfettered III will be available from Amazon and other retailers in March 2019. A limited limited edition will be available from Emerald City Comic Con in Seattle from March 14-17th. It's all down to the Pattern. In The Great Hunt, Verin says, "With ta'veren, what happens is what was meant to happen. It may be the Pattern demanded these extra days. The Pattern puts everything in its place precisely, and when we try to alter it, especially if ta'veren are involved, the waving changes to put us back into the Pattern as we were meant to be." (Chapter 44, Five Will Ride Forth) If they'd tried to rescue Moiraine at any other time, the Pattern would not have accepted it. Moiraine knew this from either her trip into the ter'angreal, or from her trip into Rhuidian (sp?). I can't recall because I'm only at The Great Hunt on my reread. That was why she made Thom wait until Mat asked. She knew it was their only chance for success. Sarah said it to Ludo? Yes! You're right! I got them confused. Alanna was with them. But I guess we don't know who the other Green sister is. Maybe Myrelle was in the area and Moraine went out to meet her somewhere in Shainar? Myrelle is one of the sisters who comes to Fal Dara with the Amyrlin. They could have chatted then. Though I doubt it because the Greens and the Blues are fighting (Greens have been backing the Reds in the Hall). Or maybe Moraine was sneaky enough to meet Myrelle in secret, then. But there definitely wasn't enough time for Moraine to go to Tar Valon. The Amyrlin's party traveled nearly a month, and that was with the ship and calling on the winds to speed them up. I may have to email Maria Simons and see what she knows! It's gonna bug me! *lol* Well, then you were right! Oh! Jareth says it to Sarah! A good way to look at a lot of experiences in life, I think. Yes, this is true, too! She grows a ton over the few hours she's in the labyrinth, as shown by how she begins to pack up her toys and books and plays when she's back in the real world. I also love this idea, that the bad things that happen can be what brings us to salvation in the end. It kinda ties in with the Tao Te Ching, where it talks about negative space is just as important as positive space. You need both in balance to have a happy life.